We love T-shirts. We know you do too. Otherwise you wouldn’t be reading this in the first place. So, let me introduce Tee zine to you. Tee zine is a T-shirt reviews blog dedicated to great T-shirts and T-shirt designs worldwide. We started back in 2008 and we publish T-shirt news, review physical T-shirts and T-shirt online shops, interview T-shirt designers and publish articles on how to improve your T-shirt business or start another T-shirt blog just like ours. Tee zine is also an independent clothing guide – we check some fine online T-shirt shops and bring you – tee addicts and tee shoppers – news on T-shirt discounts and sales. 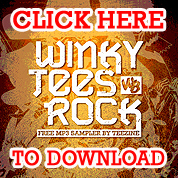 Mostly all of the stuff published on this T-shirt blog is written by me, under the name of teezine (inventive, right)? Well, I am a “30 something” journalist, blogger and a screen writer from Croatia. Second part of Tee zine team is Also, and by the way – she is a female who helps finding nice T-shirt designs on the internet. If you’d like to get featured at Tee zine or ask a question on anything T-shirt related – feel free to get in touch! Also, if you like what we write – rate or like our posts and share them on your social network profiles, and feel free to leave your comment below the posts – we want to develop T-shirts related conversation here at Tee zine and we truly respect your opinion! We hope you find Tee zine useful & informative T-shirt resource! ok this got me good, so now there will be no more competitions?